You’re reading this FatCow hosting review in order to check whether the hosting company will suit your exact requirement or not. I’m starting the review of FatCow hosting right now. It’s very important to host your website on a decent hosting company and I know that you’re aware of that. And I appreciate your effort for learning about different hosting companies as to choose the perfect one for your site. FatCow is a web hosting company that started its journey in 1998. This company had initially come up with the focus of shared hosting only and later on, started providing different VPS and dedicated hosting packs too. You’ll see that the layout of FatCow’s site is more or less similar to the site of iPage. The reason might be because of the hosting companies are from the same group of industries, Endurance International Group (EIG). Yes, you heard it right. FatCow is a hosting company of EIG. As you know that EIG preserves quality when it comes to providing different hosting services, you can expect a good service from FatCow. I believe that your expectation isn’t baseless since FatCow also provides awesome hosting services. Not only are the hosting services, FatCow is also a great domain registrar where you can register your domain within a few minutes. From hundreds of real benefits of FatCow hosting and domain related services, I’ll have to mention a few because I know the value of your time. So, I’m gonna mention just the notable benefits of FatCow. The first benefit is that you can start and run a website using FatCow by paying a little amount of money. Not only is that if you feel that you’re not able to pay your hosting bill at a time, then there’s the monthly payment option too. This is really a nice option. When you start your site, you don’t have to worry about buying your domain as it comes free with any hosting packs of FatCow for the first year. With FatCow, the sky’s the limit as the Oodles of storage and bandwidth offer you unlimited use of web space and bandwidth. With an exciting uptime and fast server response time, your online presence is comfortable. And if there’s any problem you face with your site, then let the support team of FatCow know about it, they’ll come to you blazingly fast and solve all your problems. So, you’ll need to use a scientific calculator if you wanna calculate the benefits of using FatCow. Free domain. With all the hosting packs of FatCow, there’s a free domain allowed for the first year of any of the hosting plans. 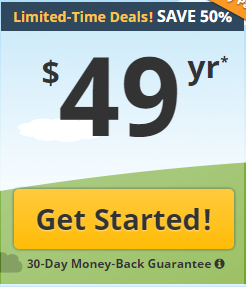 So, you don’t need to pay the bill for a new domain that you would need for HostGator. Unlimited domain and subdomain per account. Yes, you can host as many domains as you want on a single hosting pack. 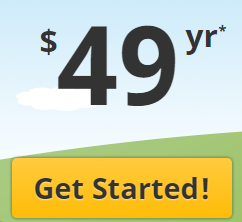 The $49/year hosting pack is also capable of hosting unlimited domains. The same thing is true for hosting subdomains. Unlimited email accounts. 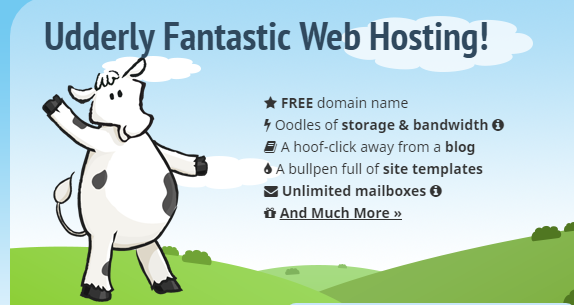 Not only is the domain, you can use unlimited email accounts with any of FatCow’s hosting packs. Unlimited MySQL databases. Also, the MySQL database is unlimited indeed. Storage. The web space provided by FatCow is unlimited, so you can upload any amount of content to your site. Bandwidth. Unlimited bandwidth is there even with the shared hosting pack of FatCow. So, prepare your site for any amount of traffic reception. Control panel. FatCow provides the ultimate website management control panel, the cPanel. 1-Click installer. FatCow allows its users to use MOJO Marketplace which is a renowned one-click installer that walks parallelly with another fabulous one-click installer, Softaculous. Free website builder. The starting plan of the website builder is free, so you can have the touch of this awesome website builder without paying a penny though there are premium plans too. Free shared SSL certificate. With the shared hosting pack of FatCow, you’ll get an SSL certificate for free. Amazing! Right? Daily free backups. Your hard work won’t go in vain if there’s any accidental action done that deletes your content. There’s the daily backup facility which comes free of cost. 30-day money back guarantee. 30 days is a long period to test whether a thing is good or not. So, during this long period, you can judge how good FatCow is as your site’s hosting provider. So, never feel worried to start your site with FatCow since you’re getting whopping 30 days to get your full money back. As said before, you get a free domain (for the first year only) with any hosting packs of FatCow, but you can also register any domain individually. The next page will come up with a blank box for checking the availability of your desired domain. I’ve checked the above domain name and found that it was available. The price of a domain is very cheap which costs only $8.99 now. So, you can use FatCow as a domain registrar too. There’s no provision for buying an SSL certificate individually from FatCow though you’ll get free SSL certificates with all the hosting plans. So, there’s no need to buy an SSL certificate separately. But in case you wanna buy only an SSL from FatCow, then the company will disappoint you. I’ve already mentioned that FatCow will give you the room for using its WebsiteBuilder for free too. Note that the free plan comes with a lot of limitations, so if you wanna use the site builder with all its features, then you’ll have to go for any of the premium plans. Now is the time to let you know about all the plans of FatCow hosting. I guess you’re waiting for it for a long time, huh! Okay, let’s explore all the hosting packs of FatCow right now without making any delay. This is the only shared hosting plan of FatCow that comes with an amazing price tag for the first year of its purchase. FatCow doesn’t directly name it as a shared hosting plan though you should know that this is the only shared hosting plan that the hosting company provides. You’ll get all the facilities mentioned in the feature part of this post in this hosting plan. 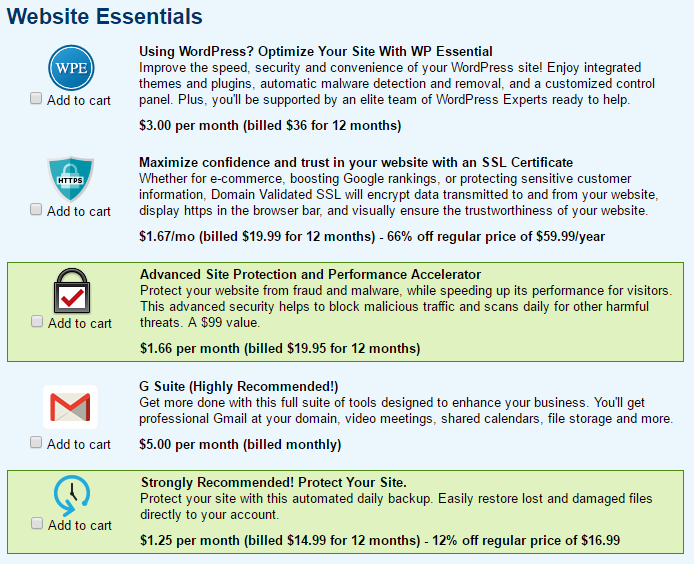 So, don’t hesitate to use this hosting pack to start your site as it’s full of goodies. Note that you can use the toggle bar to upgrade or downgrade different VPS plans. Swap the toggle bar left or right to check different VPS hosting plans. The dedicated hosting packs have made FatCow hosting as a complete hosting company. You can use the toggle bar the same way that you have seen in the case of VPS hosting plans. All I can say is that both the VPS and the dedicated hosting plans of FatCow come up with a lot of exciting features and benefits. How to buy services from FatCow? Buying a hosting pack from any hosting company isn’t a hard task. Yes, you can buy your preferred hosting pack from FatCow within a few clicks. Step 1. The first step is quite simple and straightforward. Visit FatCow web hosting now and then land FatCow’s site. Now, you’ll have to hit the “Get Started” button seen under the price tag of the hosting pack. It’ll take you to the next page. You have 2 options – one is to register a new domain (you’ll get a free domain) and the other one is to use a domain that you already own. I’ve tested with a domain and since it was available, I was taken to a new page for taking the further steps. So, fill up the form with all the correct information and then, go to the next form of the same page. Do the same thing, I mean fill the form with your payment information after choosing the payment method as Credit Card or PayPal. Note that if you own a Payoneer MasterCard, then you can pay with that using the first option (Credit Card). You can see that the first option is for choosing the period for your purchase. So, select it as per your need. I’ve already told you that you can also buy FatCow’s hosting pack on a monthly basis. This is the option for doing that too. So, choose which plan you like or need the most. Select all the required services as some of these are quite necessary to run a site comfortably. Step 8. Once you have filled up and chosen all the fields clearly, now you can hit the “Check Out” button situated at the bottom of the same page. This will start processing the payment and deduct the purchased amount from your credit card or PayPal that you have provided. After the processing of the payment, you’ll get a confirmation email to your given email address. You’ll also get some other welcoming message and guidelines in several emails. How to create a website without any coding? This part is very important and you should check this part as to know the performance of FatCow. In fact, anyone will want to learn the performance of a hosting company before buying its services. You can check the performance of a hosting company in different ways. Here, I’m showing you 4 important performance testing methods. I gave the green marks to the results that gave me more than 90% of uptime. If the uptime had been below 98%, then I would give a red mark on it. Then, the next method is to test its speed. You know that I use the tool of PICKUPHOST to test the speed of a hosting company. The next performance checking option is on your site. You can do that once you use the hosting of FatCow. I’m showing you my experience. I used PageSpeed Insight tool to check the server response time. Another performance checker of a hosting might be its support team. You have seen that the hosting company offers all the 3 types of contact facilities like phone, chat, and ticket submission. I haven’t tested the phone support of the company though I can tell you the experience of chat and ticket submission very well because I’ve tested them several times. The chat needs 5 to 10 minutes depending on the congestion to start a conversation. In this regard, Namecheap provides me better support. They only take a minute or to start a conversation with their live chat support. I’ve also submitted several tickets to FatCow and they usually respond within the same day. In this case, I prefer Namecheap too. Above all, the support of FatCow is promising and you shouldn’t have any complaint about the little delay in response. Nothing has 100% positive sides, so FatCow has some negative sides too. Now, I’ll show you both the positive and the negative sides of FatCow’s hosting services. I think that I’ve come a long way to let you know the final verdict now. Yes, you have already seen many of the exciting features, pros, and cons of FatCow’s services. Now is the time to rate the hosting company. By analyzing all its services, I’m not afraid to give the hosting company a 4-star rating. I believe that nobody can underestimate this rating as FatCow is a powerful web hosting company that serves amazing services to its customers. It’s true that there are some lacks (and what doesn’t have any lack?) of the hosting company, but if you consider the positive sides, then you can easily forget the negatives sides. This is the ending part of FatCow review where I wanna learn about your decision. After reading the thorough review on FatCow, what’s your decision now? Lemme know if you wanna learn something more about the hosting company. 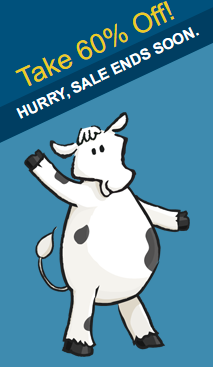 Start your website with FatCow and run that smoothly. I wish your happy online business. Thank you very much for being with me reading the review.